THE FINANCE MINISTER has said he will be monitoring the prices of excisable products such as alcohol and cigarettes in Northern Ireland to prevent differences that would see people crossing the border to shop. 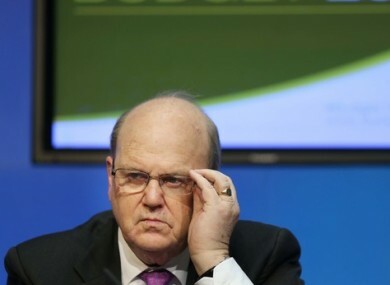 Michael Noonan made the comments in the Dáil when asked about his plans to prevent loss of trade to Irish retailers. The Alcohol Beverage Federation of Ireland says Brexit is a huge challenge for the drinks industry. The ABFI represents alcoholic drinks manufacturers and suppliers in Ireland. Director Ross Mac Mathúna told TheJournal.ie,”Irish consumers already pay the highest prices for alcohol in the EU at 175% the average. When the high prices are combined with the recent devaluation of sterling, cross border shopping becomes very attractive. “This loss in trade will have a detrimental effect on the local economies in border towns and the retail trade in particular. The fall in the value of sterling by 15%-20% means that products like alcohol which were already 20% cheaper in Northern Ireland than the Republic of Ireland are now up to 40% cheaper. The above figures are based on a cross border price comparison carried out in November 2016, updated for the euro-pound exchange rate as of 20 March 2017. Mac Mathúna said he wants to see a cut in excise duty. He said Ireland has the most expensive alcohol in the EU which penalises consumers and impacts tourism. Noonan said that price differences between the South and North are determined by VAT and excise rates in both jurisdictions, exchange rates and the pricing strategies of retailers. Email “These are the price differences in alcohol and cigarettes across the border that Noonan is monitoring ”. Feedback on “These are the price differences in alcohol and cigarettes across the border that Noonan is monitoring ”.